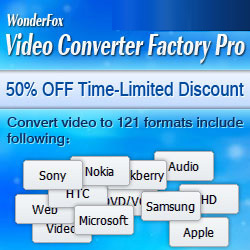 With a series of blockbusters hitting our eyes and hearts in June, WonderFox Soft, a professional provider with diversified multimedia software, will release DVD Ripper Pro v7.4 as Giveaway to all netiziens to enjoy the the film feast, which would be a very great opportunity for cinephiles to surf in the film with WonderFox Soft DVD Ripper Pro v7.4, valid until June 21st. If you also believe that “oxford,not brogue”, you would not miss Kingsman:The Secret Service, the extremity counterattack from British Gentlemen. Fifty Shades of Grey, you can learn about the delicate dating relationship between lovers. If you crave for the film of war theme, you can choose American Sniper, which can experience the true life of a soldier in the brutal war. In addition, you can feel the pure soul from the robot Chappie. And the best way to store those fantastic movies is to rip them from DVD with WonderFox DVD Ripper pro. With simplicity of the interface and clarity of the guidance, WonderFox DVD Ripper Pro is a technical software for ripping and backing up the DVD discs. High speed for DVD ripping, ample formats for DVD converter. More special features and strong functions are waiting for you in the wonderful DVD ripper giveaway. ★ Convert any movie DVDs to AVI, MP4, MPG, MKV, WMV, MOV, MTS, M4V, ASF, DVC, MTS, M2TS, WEBM, FLV, SWF, VOB, F4V, 3GP and 3GP2 without any quality loss. ★ Rip movie DVDs to portable devices, like iPad, iPhone, Android Tablet, Samsung Galaxy phones, Apple TV, HTC cell phone, Nokia Lumia, Blackberry cell phone, Sony cell phone and PS, TVs, XBox,Wii, Kindle Fire, Surface, etc. Backup kingsman:the secret service and other films as you want which is really a happy thing. ★ Decrypt CSS and region code protections, WonderFox DVD Ripper can help you remove/bypass any protections such as CSS protection, Region Code Limitation, Sony ARccOS Protection, Disney X-project DRM.